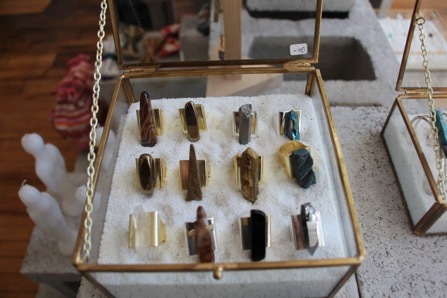 5 Things You Missed at Michael..
MASHALLAH Studio, a jewelry boutique in Pilsen, is the brainchild of a Chicagoan with a creative spirit and a mind for business. The experience of walking into MASHALLAH studio is best described as “curated.” From the first moment, you get the sense that someone carefully designed every detail to alight the senses. Soft light pouring in through the windows envelopes the space in warmth, a mellow neo-soul track plays softly overhead, and the earthy aroma of some essential oil wafts through the air. 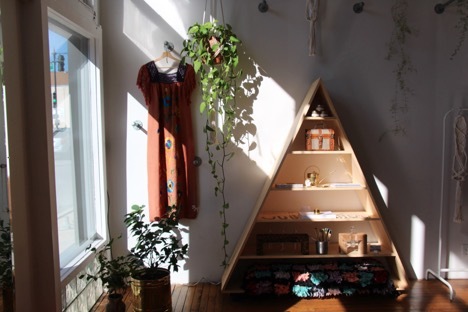 Geometric shelving is ornamented with the boutique’s offerings; soaps and candles, trinkets from around the world, and lots of handmade jewelry. The store has the sort of aesthetic that big brands like Anthropologie try to achieve, but feels much more authentic. Once you meet Mashallah Ghouleh, the store’s owner and namesake, everything about the space becomes clear. With a full face of makeup, and hair in a tight knot on top of her head, it is obvious that this is a woman who puts thought into her personal style. But once she begins to speak, the signature look gives way to a warm smile and a deep, throaty laugh, as she welcomes you in like an old friend. Her hands, adorned with her own work, catch the light as she flits around the store mingling with customers. Her art, and indeed the entire store, are an extension of Mashallah’s personality: boldly unique, and charmingly engrossing. MASHALLAH the brand began in 2010 when Ghouleh, a Chicago native, first began making jewelry. Shestarted in the fashion industry first with her own hair and makeup company, then later working at AKIRA, the Chicago-based women’s clothing company. Ghouleh credits her four years there with teaching her the business skills necessary for running a retail business. Her transition to jewelry making, however, began as a fun activity with friends. But this hobby quickly turned into a full-time job. She made her designs in her home studio and sold them at craft fairs in Chicago and around the country. As demand for her work grew, Ghouleh sought help to expand her operation, and two years ago she met and hired Heather Bland as an assistant. Bland, who studies public relations at DePaul, began by helping Ghouleh with the jewelry making, then as a sales assistant at shows. Now, she primarily serves as the store manager, but continues to do “a little bit of everything,” in her words. At the core of Ghouleh’s success is the jewelry itself. When designing rings, bracelets and necklaces, she uses many of the same materials — namely raw gemstones — throughout to create continuity and give her entire brand a distinctive look. With the help of Bland and two other employees, Lily and Coraline, Ghouleh has grown her jewelry making into a full-fledged enterprise. After six years of working out of her home, she moved in September 2016 to her current storefront on Halsted Street in Pilsen. Now, Ghouleh can be found most days in the back of the studio, surrounded by pliers, beads and stones, creating jewelry to fulfill wholesale orders that she sells to other boutiques around the country. 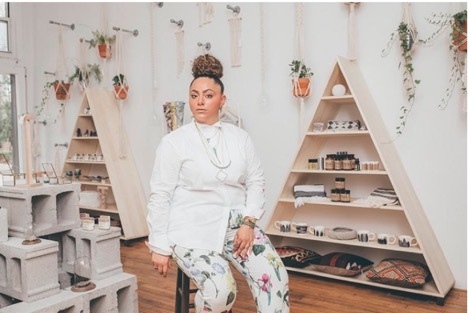 On the retail floor in the front, her own work sits alongside candles, greeting cards, and other goods from local Chicago artisans with whom she partners. “While we continue to attend many art and music fests here in Chicago, having a dedicated space allows us to create a well-rounded experience for our patrons. MASHALLAH studio is our creative space and lifestyle shop,” she said. In December, Ghouleh hosted a party at the shop showing off all of her new finds she collected on a recent trip to India. Throughout the night, women milled about the store, looking at intricate tapestries and detailed statuettes, and getting henna done by a professional artist. Ghouleh meanwhile chatted and kissed and mingled with everyone, absolutely in her element. The party, like many of Ghouleh’s initiatives, are all a part of her plan to grow her business to the next level. Even though she considers the shop to be a creative space, she puts to use the business acumen she has developed over the years and runs a tight ship. “Planning at the beginning of the day is most valuable, as doing so keeps the team focused on high priority tasks and deadlines,” said Ghouleh. The studio had its first anniversary this past September, but the team didn’t spend too much time celebrating. Instead, they are looking ahead with even greater aspirations. Ghouleh hopes to get into philanthropy work, while continuing to share her art with more people.